Looking back over the past ten years, the U.S. economy and stock market emerged as unlikely winners. A decade ago, Lehman Brothers and dozens of other financial firms were in the midst of collapse. In short order, the financial system and economy entered into a very dark period, culminating in a deep and painful recession. Equity markets fell by over 50% and 8.7 million Americans lost their jobs as the unemployment rate soared to 10%. From those depths, a recovery took hold and led to an expansion which endures today. Employment rolls are again full, as 20 million net new jobs were added since 2008. American wealth has also returned to record levels. According to the Federal Reserve, United States’ household net worth now stands at $106 trillion, up over 80% from the 2008 low water mark. Stock market indices are again at records and the S&P/Case Shiller 20 City Home Price Index is back to levels not seen since 2006. The initial rise in asset values following the crisis eased pressure on the economy and financial system. Fewer leveraged borrowers were driven into forced liquidations as asset values grew. This was helpful to both the borrower and the borrower’s financial institution. At the time of the crisis, a significant expansion of borrowing and spending by the government was called for to right the ship. Extraordinary monetary policy measures were also implemented including cutting short-term interest rates to zero and massive purchases of public and private assets. The combination of these measures helped create an environment conducive to risk taking, which helped jumpstart the recovery. Today, the pendulum has swung the other way, and some of these policy measures no longer seem appropriate. Employment is full, confidence surveys are near records, asset prices are up, and inflation is beginning to firm. 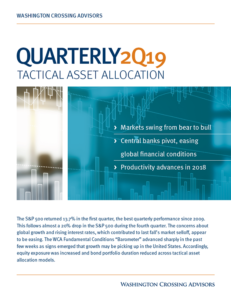 The Federal Reserve’s own estimates see current economic growth running hot relative to sustainable long-run growth, and inflation is also expected to run slightly above target. At 2.25%, short-term interest rates are broadly in line with the inflation rate but remain well below past rate cycle peaks (chart, below). 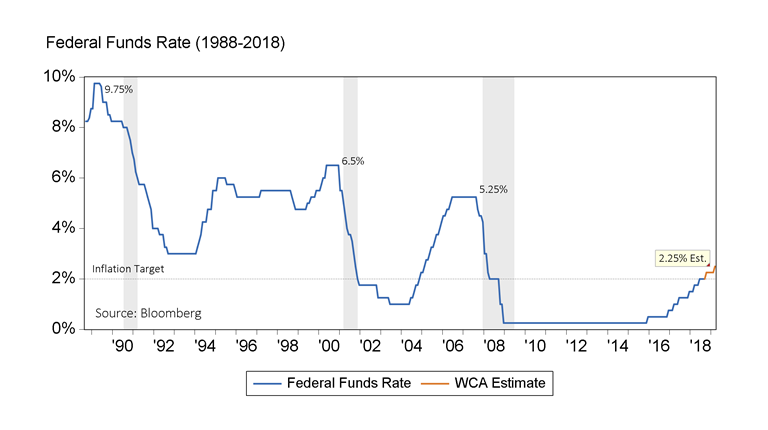 Therefore, we expect the Federal Reserve will further raise overnight lending rates, lifting our expected return on cash and other high-quality, short-term instruments. Looking ahead, we expect positive, but lower, returns from equities. Our latest “base case” estimate calls for roughly 5-5.25% long-run equity returns, 2.5% long-run Treasury bond returns, and cash returns near 2.8%. Key to this outlook is the return to a better growth trajectory for the United States economy. 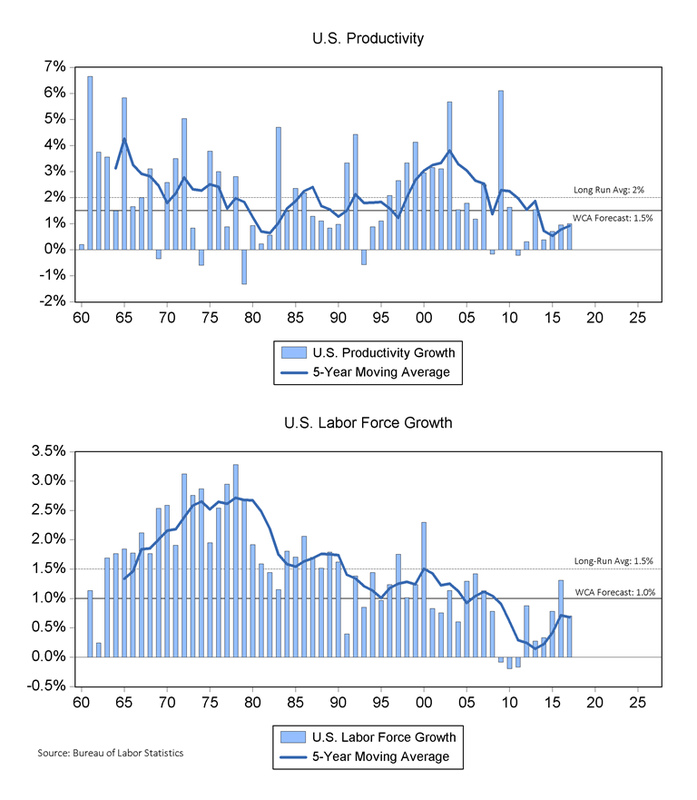 After a long period of declining capital investment, labor force, and productivity trends, we expect to see some improvement back toward historic levels. Investment: Aging infrastructure in productive capacity and public infrastructure raise the relative attractiveness of investment in new equipment and infrastructure. Recent tax reform provides an incentive for capital investment through accelerated depreciation and lower business tax rates, and we are seeing rising trends in capital goods and business investment. Labor: Tighter labor markets are also encouraging formerly discouraged workers to come back into the labor force. With improved participation rates, we are estimating long-run labor force growth near 1% annually. If achieved, this would fall short of the long-run historic average, but be somewhat better than the post-financial-crisis years. Productivity: We see tentative signs that productivity may begin to firm up. For most of the past 50 years, productivity in the United States rose about 2% per year. Since the great recession, that growth fell to roughly 0-1%. We see no reason why productivity growth will not be gradually drawn back toward historically normal levels over time, encouraged by ongoing discovery and development of new and emerging technologies. Combining 1% estimated long-run labor force growth with 1.5% estimated long-run productivity growth suggest economic growth potential near 2.5%, before inflation. Adding a 2-2.25% inflation expectation to this forecast translates to total growth in the 4.5-4.75% range. This range is lower than past decades, but somewhat higher than the post-crisis years. Overall equity exposure is close to benchmark weight, given current neutral readings from our WCA Fundamental Conditions Barometer. Largely because we see better domestic growth than overseas, we are maintaining a domestic tilt as we start the quarter. Furthermore, we currently estimate a better reward-versus-risk trade-off in developed markets versus emerging markets. 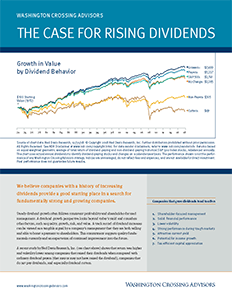 The domestic equity portion of portfolios is now biased toward the value style versus growth, given more favorable estimated valuations among value-oriented sectors. Except for a small bias toward shorter-duration along the curve, fixed income allocations remain close to benchmark allocations as most risk premiums remain compressed. The S&P CoreLogic Case-Shiller 20-City Composite Home Price NSA Index is a value-weighted average that seeks to measure the value of residential real estate in 20 major U.S. metropolitan areas. The index is a composite of single-family home price indices for the nine U.S. Census divisions.